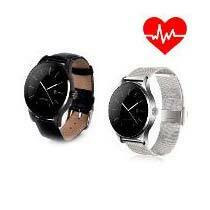 We are counted as prominent organization indulged in providing a wide assortment of VCARE Smart Watches (V06B-S). These provided products are designed and developed under the rigorous guidance of accomplished experts using supreme quality and ultra-modern technology at our end. These Wrist Watches are smoothly working and display correct time due to their advanced technology. Our team of experts designs this watch that suits the preferences of the people of all age groups. The Quantum Super Tab is offered to the market at a reasonable price.